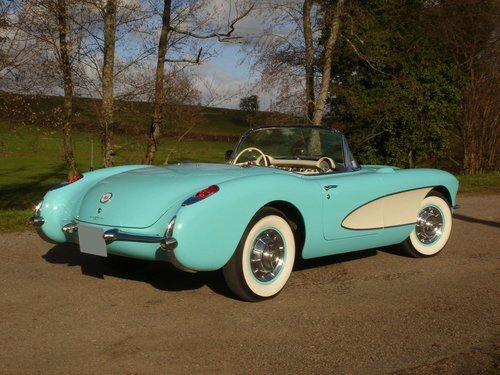 1955 marks the apparition of the V8 on the corvette, an alternative to the "Blue Flame" 6 cylinder. 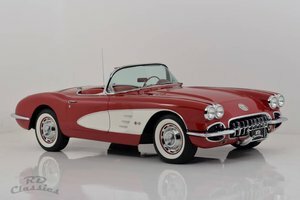 From 1956, all cars were equipped with the V8, whose power will never cease to increase, on an unaltered chassis, whereas the bodywork was drastically redesigned. 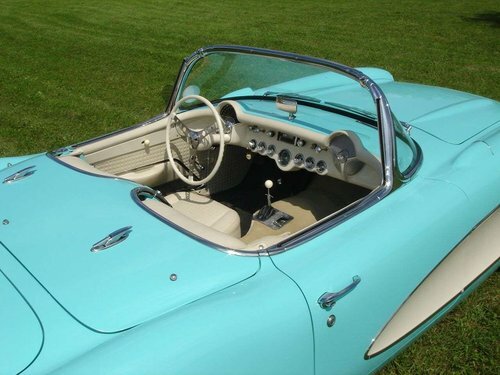 The serial equipment was notably characterized by a dual exhaust, a competition-style three-branch steering wheel, an external rear-view mirror and an electronic dashboard clock. Our model was delivered new in June 1957 and presents a beautiful " Cascade green " livery with white sides and a vinyl beige interior. It is equipped with the powerful V8 283ci , producing 270hp, mated with an optional 4-speed manual gearbox. 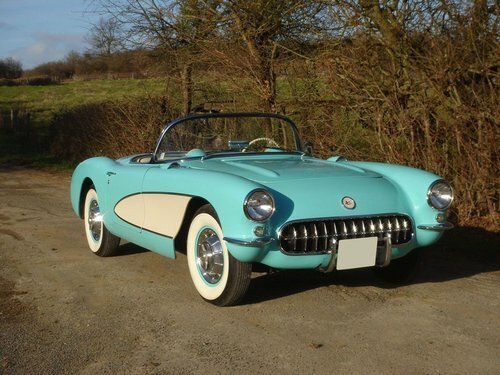 This beautiful Corvette was acquired in 2013 by its current owner, after benefitting from a reconstruction in Germany. 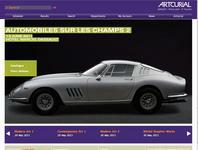 The current state of the car is a clear demonstration of the quality of the work that has been carried out. In recent years, the clutch was replaced and disc brakes were fitted at the front in order to halt more effectively the fiery V8. The whitewall Goodrich tires are new, assembled on new rims. The 4 original rims will be also be supplied with the car. This vintage combines the design of the "single light" versions with the performances of the V8 which have contributed to the fame of the model.